Snapchat a new marketing tool? As stats begin to show Snapchat is fast becoming the new facebook for younger users, Over 350 million images have been sent over Snapchat and it is growing fast! Today’s youth have realised the publicity issues that arise on facebook whether it be images permanently staying online, Parents, Employees, and friends of the family seeing their antics, They are now beginning migrating to Snapchat. Snapchat is a new service that allows the user to capture an image and send to their friends and followers. So what makes this different from any other photo sharing platform? Snapchat has a time limit on every image up to 10 seconds making this app a fast and fun service to capture a moment. Receivers have an option to screenshot this image if they wanted to keep it, share it, or show it to somebody else making that image ever more a bit special while other images are discarded. There is also a story option in Snapchat which images can last for 24hours and can create a narrative of the day or a promotion. This now offers a new platform in Digital marketing in Ireland and a Dublin Night Club has taken advantage of this opportunity by issuing Invites to a club night. 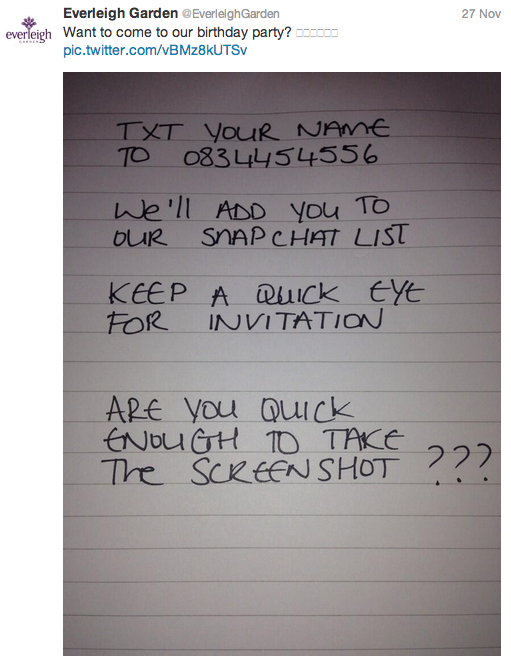 The idea consisted of Snapchatting an invite to their targeted audience and asking people to screen shot the invite to produce on the door of the nightclub. This fast promotion generated hundreds of numbers to be added to their Snapchat account and generated a high success rate. How can you market on Snapchat? Buy building a following on Snapchat a user can create a marketing opportunity by Snapchatting a promotion, a lunch time special or a weekend Discount offer for Snapchatted screen shots.